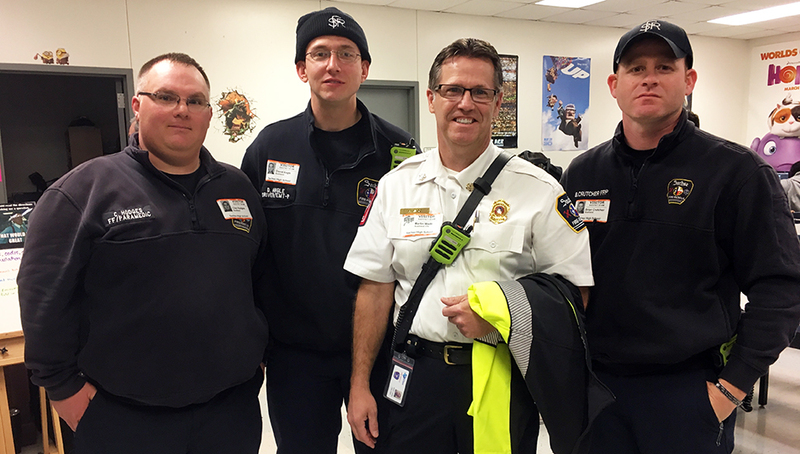 Sachse High School is partnering with the fire department to meet real-life training needs for the city. 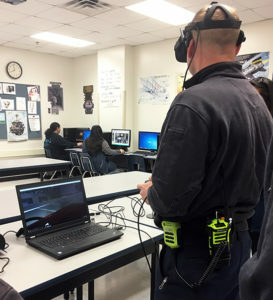 Students at Sachse High School have created a virtual reality training program customized for the city of Sachse and its fire department. It’s an ongoing, three-year project for third-year animation and computer science classes at the high school. It’s lead by animation teacher, Erik Bushland, and computer science teacher, Jessica Garcia. The project initially sought to give students a chance to practice skills learned in class such as coding, animation, and business strategies, but then lead to a partnership with the city’s fire department. “The fire department has been very supportive;they’re our client. It doesn’t matter what we like, it’s what they like and need. So [the students] are getting that experience,” Bushland said. Bushland said they didn’t go to Sachse FD until they already knew the capabilities of the program. He originally thought it would train firefighters to actually put out fires, but the fire department requested they focus on driving first. The program will pull up a random address and the trainees will have to navigate there. The game deducts points if they don’t follow the speed limit, hit any vehicles, or mishandle any other real-life situations. This VR training could allow the fire department to reduce costs such as wear-and-tear on its vehicles. The VR training hasn’t been implemented yet, but Sachse Fire Chief Marty Wade said it will be an added layer to the department’s current offerings. A firefighter uses VR to view the program. Every student taking the classes is focusing on a different aspect of the project. Two students are working on the physical map of the city. They’ve already created several thousands of buildings as well as some of the streets of Sachse. There also are two students working on lighting, a few working on a model of Sachse High School, and several coders programming the game. One problem the students are working on is automatic restart. When a user goes past the edge of the created map in the current program, they fall infinitely into nothing. Garcia said they are working on making the program restart and put you back to zero on its own — instead of having to do so manually. According to both Garcia and Bushland, one of the biggest aspects of the project is the creative problem solving it requires of the students. “The city doesn’t have a map of what the speed limits are so the students are taking a tour through Google Earth … to look for the speed limit signs,” Bushland said. Students work at a bank of computers. The Sachse Fire Department has been supportive of the students’ work. 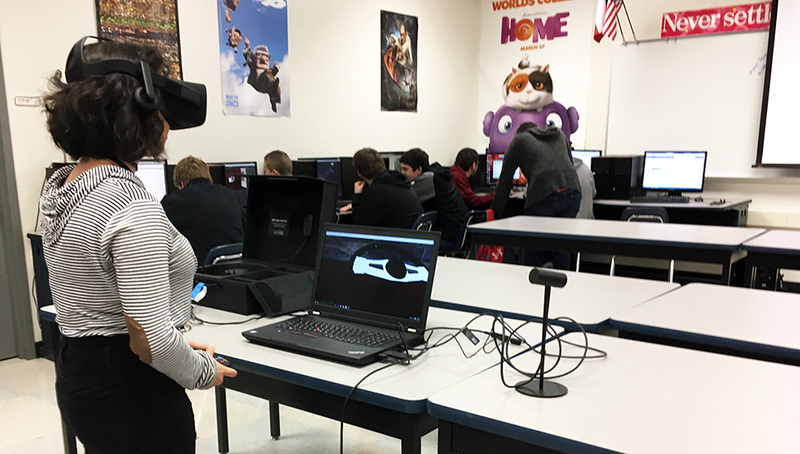 A student views the program through VR goggles. A Sachse Fire Department truck sits outside the high school.